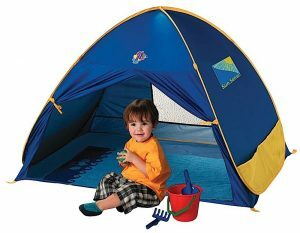 The Schylling UV Play Shade is a crowd favorite baby beach tent. Taking little ones along to the beach requires preparation to ensure that kids stay safe and comfortable. For very young children, protection from the sun’s rays and excessive heat is incredibly important. One of the most effective ways to combat these dangers is to make sure baby stays in the shade for most of the day. We’ve put together a list of the best beach tents for babies to help you find the right option for your family. 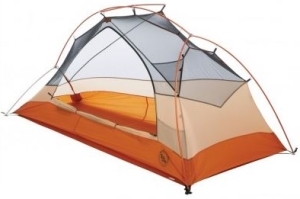 Whether you’re searching for a tent that accommodates just baby or a tent that allows enough space for adults as well, we have a few great models to consider. Browse the table below to get a sense of the types of baby beach tents and compare them by capacity, height, average rating, and price. After the table we’ll delve into detail on two of our favorite beach tents for babies: one that’s suited for only little guys and one that’s catered toward family use. Hopefully the chart above was helpful in determining which baby beach tent will be best for your family. Below we’ll go into more detail on two of our favorite options. If you’re looking for a convenient, small baby beach tent, the Schylling UV Play Shade is a good option. This tent is meant to accommodate one adult or a few little ones with a width of 51 inches, a depth of 39 inches, and a height of 31 inches. It has a simple popup frame that can be set up in a few seconds, a definite plus for parents towing kids along to the beach. 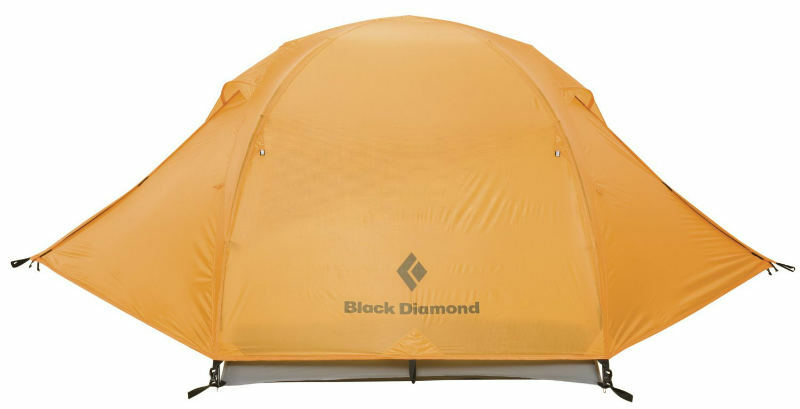 An SPF 50+ sun protected canopy provides plenty of safe shade for small children, while a large mesh window on the back of the tent provides ventilation. 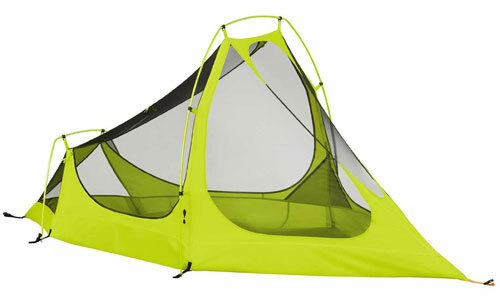 The tent comes with tie down pegs and sand pockets to hold it down depending on where it’s being used. It also has an accompanying carry case for easy storage and transport. Downsides mentioned by parents are that the tent can be difficult to take down, and some parents wish the tent was ventilated better. The Pacific Breeze Easy Up Beach Tent has maintained an admirable high average rating after thousands of reviews. 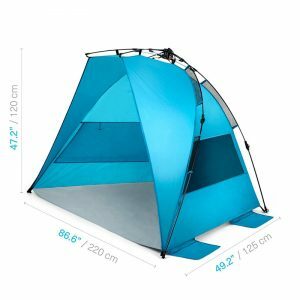 It is sized to accommodate two adults, so if you want to be able to hang out inside the tent with your child this is a good option. It measures 86.6 inches wide by 49.2 inches deep and stands at 47.2 inches tall. Even though it is spacious, it is not cumbersome to set up and carry. It weighs just under 3 pounds for easy transport and is a snap to get standing. The popup fiberglass frame takes just a couple of minutes to put up or take down. 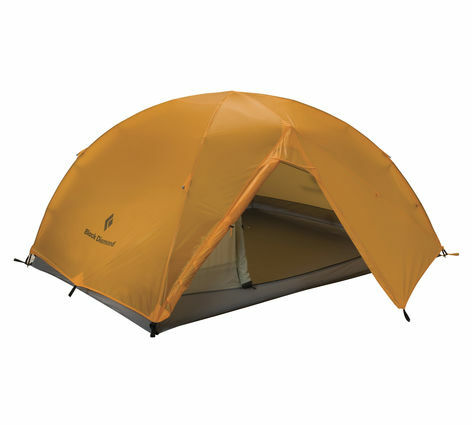 Purchase of the tent also includes a carrying case and stakes. Another reason this tent is included in our list of the best beach tents for babies is because it offers excellent protection from the harsh sun. The tent’s canopy provides UPF 50+ sun protection, and the tent’s sides are ventilated with large windows to prevent excess heat buildup. Two interior pockets are included on this inside of the tent, perfect for storing small beach items like sunscreen. 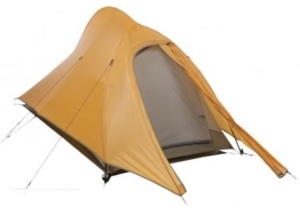 A 1-year limited warranty is offered for this tent. Tent owners who have had to interact with Pacific Breeze’s customer service team report that they are extremely helpful. The largest complaints about this tent are that it’s too small to fit people plus a cooler and other beach accessories inside. For sheltering people, however, the tent has earned high praise. Want More Beach Tent Options? If you didn’t find the right beach tent for your family on this page, check out our more general article all about beach tents for more options.